Have you ever wondered which famous celebrities enjoy fishing? I have too. The following is an extensive list of well over 75+ celebrities fishing. These famous people that enjoy catching fish include movie actors, actresses, comedians, singers, musicians, amateur athletes and professional sports players, presidents, reality show stars, and other public figures that you might see on television. Some of these celebs may be more known for one profession than another. For example, Dwayne "The Rock" Johnson started out in the WWE, but has transitioned into the movie and television scene. Therefore, we have listed his name into both categories. However, some of our famed people may only be listed into just one category for which they are most notable for. So, if you don't initially see somebody listed under a particular category, scroll through one of the others that they could possibly be found in. 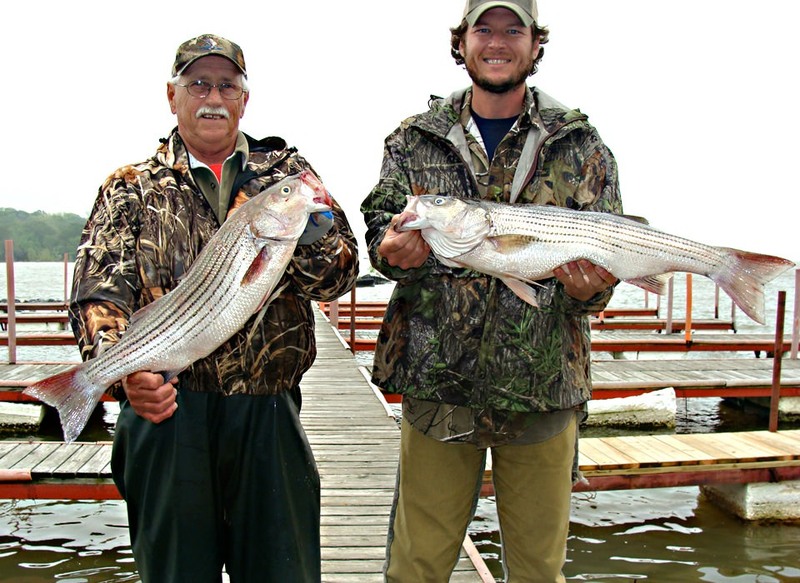 Country music superstar Blake Shelton and pops with their striped bass. If you do not see a famous celebrity that loves freshwater fishing or saltwater angling listed above, give us a holler through our contact page, or comment below using the facebook form. Eventually, we will be adding articles with pictures for each fishing celebrity as we are able to.